Pushpanjali in Maizuru Red Brick House – March 18, 2012. Ronita Mookerji has been trained in Bharatanatyam from a tender age of 5 years and she did her Arangetram (Graduation) in the year 2007 in Kolkata and still continues training in it. She has also undergone training in Odissi for 2 years under Guru Alokananda Roy. Trained in classical Bharatanatyam for more than 18 years, Ronita moved from Kolkata to Bangalore in 2008 to pursue contemporary dance. She graduated with Honours from Attakkalari’s Diploma in Movement Arts and Mixed Media in 2009. During the Diploma programme, she trained in Kalarippayattu, Bharatanatayam, Classical Ballet, Contact Improvisation, and Contemporary dance technique. She has also explored Jazz, Pilates, Kathak and Light Design through shorter modules. After joining the Attakkalari Repertory in 2009, she trained with visiting artists in the following modules: Hip Hop with Storm (Germany), floor work with Kama Jezierska (Poland/ Iceland), the Flying Low Technique with Vangelis Legakis (Greece/ U.K.) and contemporary dance with Richard Siegal (U.S.A. / Germany / France), Contemporary Techniques with James Mac-Gillivray and Kayleigh Ann Crook from London. With Attakkalari, she was a Senoir dancer/instructor/choreogrpaher now and has performed at various shows, corporate launches and meetings like for Robert Bosch, All-Indian Science Meeting, State Bank of India Annual Day, Global Health Meetings and cultural events across India. Ronita performinf in Kolkata at Swabhumi on June 17, 2018. My Journey with Yoga started from a tender age of 4 years in Kolkata. My Yoga practice ran parallel to my Bharatanatyam classes for the longest period of time. When I started dancing professionally in 2009, it was this prior knowledge of Yoga that helped me realise the dynamic flow through the movement sequences and static postures, using breath to release and engage muscles and be able to control the subtlety and strength of my physicality. 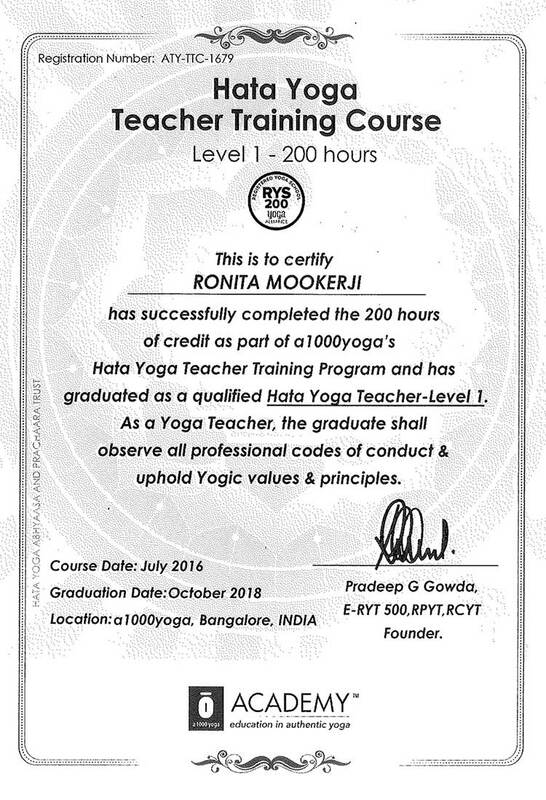 Hence,Yoga has been an ongoing training practice for me alongside my career as a Professional Dancer since 2009.To further my in-depth studies/research in Yoga, I completed a 200-hours Teacher’s Training Program in A1000 Yoga Institute, Bangalore with certification from Yoga Alliance in 2016. Recently, I conducted a workshop incorporating ‘Yoga in Contemporary Dance’ for Mind Body Soul’s event The Yoga Affair (Summer Edition 2018) in Swabhumi Heritage, Kolkata sponsored by The Telegraph, T2 (Kolkata) for over 150 people.